A project to plant a new forest on moorland above Dumbarton has unexpectedly revealed a wartime secret. 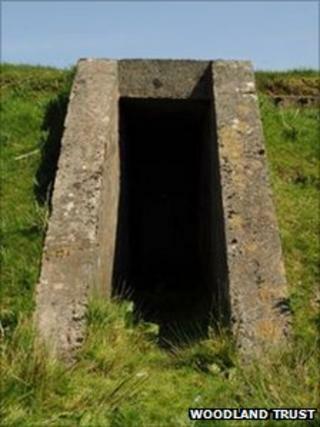 The Woodland Trust has unearthed a concrete bunker in the centre of the Lang Craigs site that controlled decoy lights. These tricked German air crews into dropping their bombs away from population and industrial centres. It was part of a successful campaign of subterfuge which, it was claimed, led to many lives being saved in the Blitz. The rough moorland above Dumbarton will soon be transformed by the planting of 200,000 trees, providing a wildlife haven and amenity for local people. It is empty now, apart from some grazing cattle. But during the Second World War, it was top secret, with War Office signs warning passers-by away. Its work came to the fore on May 5, 1941 when the Luftwaffe raided Dumbarton. Air crews saw explosions and fires on the ground as they dropped their bombs; but they were a sham -- decoys, controlled from a concrete bunker in the middle of Lang Craigs. There were two huge bomb craters in the field. It was part of a network of SF or "starfish" bunkers, named after the wartime code for "secret fires." Lights, spread out on the ground, simulated the outline of a town or industrial complex, tricking the bomber crews into targeting what was in reality an empty site. It appears many of the German bombs on the raid over Dumbarton dropped harmlessly onto the Lang Craigs moor. It was littered with debris when 11-year-old Bill McLeod cycled up the next morning. "As I turned into the farm, the large barn that was there, there was still smoke coming out of the top of it," the 82-year-old said. "There were two huge big bomb craters in the field and there was an unexploded bomb on the other side of the wood, which the farmer took me to see for some reason!" The bunker, which had two rooms under a mound of earth and concrete is now derelict, but the charity creating the new woodland wants to use it as way of telling the unusual history of the site. "We think there was a control room inside, and also an engine room providing electrical power to some of the decoy systems," said Roy Barlow, site manager for the Woodland Trust which has bought the land. "Out on the moors there would be fires which were meant to simulate a town which had already been bombed, so that further waves of bombers would come and drop their bombs on the moor instead of on the town." The RAF which controlled the starfish sites across the UK said after the War that 674 night attacks were delivered on decoy lights and fires during the Blitz. Seventeen people died in the 1941 Dumbarton raid -- compared to more than 1,000 two months earlier in the Clydebank Blitz further up the river. To commemorate the dead, 17 young trees have already been planted in the new woodland.